This entry was posted in Nuclear, Renewable energy and tagged Dominion Resources, Dominion Virginia Power, nuclear, PJM, renewable energy, solar, Solutions Project, Tom Farrell, wind. Bookmark the permalink. There is still no agreement as to how spent nuclear fuel is to be safely stored. Until that problem is solved, that and the cost of new nuclear generation make nuclear impractical at present. Conrad, spent nuclear fuel has been safely stored, at 104 locations across the country, for over half a century. No deaths, no injuries – it doesn’t get any safer than that. These Greenpeace talking points have no basis in fact. I agree. But the public is still spooked by it. @Conrad – thus we can approach the problem one of two ways: 1) Allow science to dictate our energy choices, while presenting the public honest assessments of risk, or 2) Allow a spooked public to dictate our energy choices, even if it puts global species diversity at existential risk. Which approach is more sensible? Bob, I did not know that spent nuclear fuel has been safely stored for more than half a century! Certainty, this fact should receive the publicity it deserves. The public always resists something new which is in their interest, sometimes justifiably so. As a kid I remember the almost hysterical response to the fluoridation of water — it was said to be a Communist plot (Communist plots were big in those days). Earlier it was the pasteurization of milk. Today it’s genetically modified crops (no different than selective breeding — the result is the same). I’m also in favor of irradiation of vegetables and ground meat to kill E.coli, but to hear its opponents you’d think the irradiated food was going to glow in the dark! Conrad, someone who remembers the flouridation scare must be in my general age demographic. And it’s a good analogy. None of the irradiated meat in my refrigerator glows in the dark, although I admit – the light comes on when I open the door, so it’s hard to tell. Why is that even the question? Build a few LFTR plants, and burn it as fuel. 1) Does differentiating between existing (and relatively low cost due to CAPEX payoff) and future nuclear merit greater attention? 2) If “baseload” is roughly 20 gw in the Commonwealth, does a nuclear fleet of in range of 10 gw cause the extent of concern that you are raising? At what point does nuclear truly crowd out renewables? 3) Demand side management merits discussion here. We already have utilities (in Texas) offering free electricity at night with (much?) higher peak pricing to encourage time shifting off peak. Wouldn’t serious time-of-day charging, with real opportunities for end users (whether government, commercial, or residential) to manage their power usage from the grid (including behind the meter power storage) make sense for this? 4) And, there is a complex space here in multiple ways. For example, differentiating between issues that are ‘nuclear v renewable’ as opposed to what Dominion is trying to do to ensure/lock its profitability at the expense of Virginians for decades to come. I always love reading your blog Ivy. Keep up the great work! – Payed off old nuclear can produce for ~3c/KWh, but new nuclear’s cost price is >10c/KWh despite the huge subsidies it gets (rate payers taking the risk via an investment levy, loan guarantees, etc.) as shown in UK with Hinkley and US with Vogtle. – The new reactor may start in ~2030. So it should still be competitive in 2050. Insolation poor Germany (Agora study) expects hat solar will produce for 2 – 4 c/KWh. Wind will produce for similar price. While electricity storage costs are declining with ~10%/a and even P2G costs are coming down greatly which will solve renewable seasonal storage problem. Germany has ~20 pilot plants at MW scale, which operate when whole sale price is low (when wind & solar produce to much). We in NL will have a commercial operated 20MW P2G installation up and running in 2017. 2) The new nuclear plant start in ~2030. PV-solar cost price declines with ~8%/a since the last 40 years, No sign that it will stop soon. Wind cost price declines with 3%/a (EU study showed that 20MW wind turbines are feasible)..
That implies that solar will then produce for ~4c/Kwh and wind for ~6c/KWh. So wind an solar will force the nuclear power plant to deliver below cost price. You can be sure that the utility will take regulatory actions to regulate solar and wind so their baby stays profitable. Since a few years PV-solar owners in Spain are obliged (extreme high penalty) to connect to the grid and then have to pay an high extra fee if they have solar. So near all citizens took their PV-panels off the roof. 3) Yes that makes sense. So in the Netherlands we are installing smart meters at every grid connection since this year. The expectation is that we are ready in 2020. You can be sure that our competing utilities will then offer many Time of Use schemes. Until now we only have a lower rates during the night and in the weekend a rather primitive form of TOU metering. 4) Those actions of Dominion are only possible because of the uncompetitive market design. Not separating off the grid fully. The grid is a natural monopoly which utilities use to dwindle competition. Here in NL the utilities were obliged by a new law to sell their grids to 100% government owned Tennet. Local grids are owned by local municipalities, etc. Our bill has separate items for transport costs (Tennet, etc) and electricity delivered (the chosed utility). An utility doesn’t have to generate itself. It can also buy electricity via contracts or at our public whole sale market in A’dam or the German one in Leipzig. Trade is in chunks of 15minutes. The market has intra-day trading, day-ahead trading, etc. And of course also futures (trading for delivery in 2018, etc), etc. Of course all computerized..
Just as the stock market. Your article is true as far as traditional nuclear is concerned when viewed only with respect to the Utilities sector – but that type of nuclear energy was always more about building and maintaining the infrastructure to support nuclear weapons with no real focus on “cheap clean energy.” Whether you love or hate the military, an economic case can be easily made that the investment in that type of nuclear energy had one of the best Return on Investment factors of any military technology ever deployed by our country – a crucial and relevant factor absent from your analysis. What you also leave out is the OTHER types of nuclear energy. MSRs, particularly LFTR designs, have demonstrated that they can be safely operated by just a few people; are truly scaleable and safe; and incidentally can be used to consume and eliminate large percentages of the mountains of radioactive wastes already created by traditional nuclear plants which cause many people a great deal of concern. Again looking at economics only, a case can be made to build several of these strictly as “nuclear waste disposal facilities” – with the side benefit of free electricity. I suspect, however, that once we build and demonstrate a few of these facilities it will turn out that they are also economically viable simply as electrical generating plants. Finally, and most importantly, nuclear energy is not slowing clean power even a tiny little bit. The 50 year trends for both solar panels and batteries are perfectly clear: the Price/Performance for each is on an exponential curve, with prices dropping by half every 3-5 years for solar and 5-8 years for batteries. The point in time when solar + battery backup will directly challenge natural gas plants without subsidies is only about 15 years out. At this point in time, the technologies are probably already in the labs for that price/performance break-even, and only an invasion by space aliens or an extinction level asteroid collision can stop it (unless you have some evidence of some other cause which might mysteriously cause all technological progress to stop suddenly – in which case I would respectfully like to know what is coming!). Government subsidies cannot materially hurry that time, nor is it likely that even draconian legislation can put it off by more than a couple of years – thus for all practical purposes the transition of the price performance leader is already inevitable. From that point forward, the vast majority of new-build power will be solar in most places on the populated parts of the planet – unless something even cheaper yet comes along. Assuming prices continue to decline, and there is little evidence to suggest they will not, after that point in time it will quickly become economical to replace existing plants with solar as well, and we will retire many of the existing plants in short order. Nuclear itself may not slow clean power, but utilities who protect their investment do! As the situation in other countries (Denmark, Germany) shows, wind+solar share of 30% is enough to create regular situations in which all other generators have to throttle to near zero or face zero electricity prices. Nuclear cannot throttle down, so this point will be reached much earlier when the share of nuclear is high (with nuclear share of 70% it will be reached at 10% share of wind+solar). When that point is reached the utility will take action to remove cheaper renewable from the grid in order to protect their major investments in nuclear. That can go rather far..
MSR & LFTR are a dream. The excellent scientists at the long ORNL trial left so much issues unsolved that the Chinese with a team of 600 scientists do not expect to have a commercial reactor before 2030/2035, while they got all detailed info from ORNL during their visit! They may want to, but they simply cannot. The bit obstacle today is batteries – they are not yet cost effective. That will change within 10 years and already the government is green-lighting independent groups to build “storage banks” which reduce peak load shaving (making their money on the difference in price between off-hours charging and peak-load release of stored electricity, thus reducing the use of some peaker plants). Nonsense, you are ill informed. More nonsense. An MSR was operated safely for over 10 years at Oak Ridge Laboratories by a single person starting it up in the morning and shutting it down at night. While no LFTR has yet been demonstrated, each component required to build such a device has. The only remaining obstacle is to demonstrate the in-situ chemical fuel processing necessary to run solely on new infusions of Thorium. There is no actual question of whether MSR or LFTR designs CAN be built, only of their economic viability. I am generally against government intervention in markets, but I believe a case could be made for the government building a few LFTR plants solely as a mechanism by which to eliminate some of our stockpiles of stored radioactive waste. I’m a newb. Do Dominion, Sierra Club and others, including the Virginia Department of Environmental Quality, have computer models that describe the costs, economic effects and climate effects of various scenarios for the production, distribution and consumption of energy in Virginia and the surrounding region for the next 5, 10, 20 and 40 years? Nuclear certainly can throttle up and down, just not as quickly as some other kinds. However, the need for this is about to start to diminish as the continuing 50 year exponential downwards trend of batteries starts reaching the point where some level of grid storage makes sense. Companies like Ambri (Liquid Metal Batteries); Aquion (batteries made entirely of cheap and plentiful materials); and 24M (Lithium Ion batteries for potentially as little as 20% of today’s costs) will make batteries so cheap that it will make economic sense to actually replace the fast generating plants with large battery backup facilities so that the other plants can run 24×7 at their most efficient levels. Nonsense. The Oak Ridge Reactor ran successfully for nearly a decade before Nixon ordered it shut down. It was manned by a single person who started it up every work day and shut it down every night – about like throwing a light switch. As I write this, the Chinese have a gaggle of scientists at Oak Ridge consulting with them to build MSRs in China. Everything is “impossible” until someone actually does it. However, in this case we already did it 50 years ago – so I would have to surmise that with today’s better materials etc. we can certainly not only do it again, but do it better and cheaper. Yes, technically nuclear can throttle down. It’s also done at reloading. But the costs (risks & additional wear) are so high that German nuclear operators never go below 70% of max. capacity. Even while they have to pay 10c/KWh to get rid of their electricity. So in real life they won’t throttle down below 70% (if at all) and act only as base load. We agree about the battery developments. I estimate that those will compete pumped storage off the market in 2025-2035 in Germany and other markets. These developments also imply that the variability of cheap wind and solar become far less important! We agree about the good cooperation of the Chinese with western nuclear scientists. The scientist who visited their MSR project and told about it in the Delft MSR Conference, was also positive about the open attitude of the Chinese. They also consulted with “enemy” India (there is a small border war between China and India). To my opinion because they ran in troubles and are desperate searching for solutions. The Chinese MSR project started in 2011. I remember vaguely that they visited ORNL in 20122. They planned a 2MWth trial reactor running in 2015. That was postponed towards 2017, and seems now to be postponed towards 2020. So their original schedule for the first commercial MSR is now 2035 (originally 2030). I doubt that that will be the last delay. You don’t want to build a reliable grid based solely on renewable since it is not economically feasible because intermittent power will always require two generation units of power to produce one unit of power. There are a lot of good facts in your article on renewable power however some Nuclear Power facts are missing. Many have been addressed by other commentors. Energy Storage is key for the success of renewable energy so that one can meet load when required. It would only take a 3 days of overcast to outstrip any available energy storage for solar and we already know that wind can be limited for weeks at a time. Baseload production using Clean, Safe and Cost effective Nuclear Power such as Molten Salt Reactors are very important for US Nuclear Energy in the future as these plants have simple design, they are inherently safe by design, can be built in 36 months (not like the current generation of reactors that take up to 10 years) and help close the Nuclear Fuel cycle (i.e. minimal nuclear waste that becomes inactive in less than 300 years). Always is a very long time. Battery prices are and have been on an exponential trend in price reductions which has been going on for over 50 years and shows no signs of slowing in the next 20 or more years. By that time the price per Kwh of backup power will be so low that businesses and homes will routinely have a few days’ backup, and power management plans to cope if it looks like production will be slower for longer than that. Still, grid backup in the form of nuclear plants like the several MSR designs on the table are very attractive, and actually compliment alternative power. They can be shut down completely, and brought on line in only a few hours’ time. Coupled with grid storage, such plants will react more than swiftly enough to extend the backup power through the longest rainy periods. It is too late to change “what is” today, thus discussion of solutions based on a snapshot of what we could do today are fruitless. Alternatives are coming for the simple reason they will be cheaper. Everything else is political theater. Another prediction of an off-grid distributed generation world? I doubt this will happen, for numerous reasons: even as solar power has dropped in cost, utility-scale generation has remain half the cost of residential; grid connection means that peak reserves are shared, not duplicated, and generation can be geographically diverse and sited where the resources are best; decoupling energy production from the home reduces the financial barrier to home ownership (i.e. not paying for energy 20 years in advance). Affordable batteries could still be deployed at utility-scale, but is the cost of energy storage dropping? Certainly battery capacity is increasing (which is great for electric cars), but last I heard, the new lithium-ion batteries still could not match old-fashioned lead-acids for cost (hence their continued dominance in ICE cars). And batteries certainly are not cheaper than pumped-hydro for grid energy storage, and neither can compete with fossil fuel for backing up variable renewables (hence the concern that solar and wind will help to lock-in fossil fuel use, in contrast to nuclear+hydro which allows near-complete replacement). Sorry, throttling up-/down & backup with MSR designs will work worse than with present reactors. The extreme high temperature (~700°C vs ~425°C for present reactors) of the salt, combined with two heat exchangers behind each other, make that power output changes create a far bigger chance that something breaks down due to the shrinkage/expansion of the improved hastelloy-N steel and other components. While power output changes will occur much slower because the steel of the heat exchange tubes have to be much thicker due to the high temperature (steel is forged at lower temp’s!) and the aggressive salt. With present reactors, German utilities won’t throttle their reactors below 70% even if they have to pay 10c/KWh to get rid of the produced electricity…. Flexible power plants are needed to compensate load changes and changes in the production by wind and solar. For that gas plants & turbines will do the job. The new low temperature burning circulating fluidized bed coal plants, which German utilities built to replace their base load coal plants, can also do major part of that job. – to cover the seasonal solar/wind production dip (Germany is at much higher latitude than USA). The generated gas is now injected in the natural gas piping system and can also easily stored in available earth cavities (S-Germany has such storage already for ~6months of Russian gas). – to serve as distributed hydrogen generation unit for car fuel stations to serve hydrogen cars. Germany’s 35 pumped storage facilities make losses as they are not needed; the share of wind+solar in electricity production is ~20%. The swings in the whole sale price of electricity are too little (av. price 3c/KWh, price swings between ~1c/KWh and 4c/KWh). Scenario studies show that storage is needed when wind+solar reaches a share of ~30%, which is in the 2025-2030 period. However many expect that then batteries out-compete the pumped storage facilities (so their owners may never see any profit). The German battery program for small rooftop solar (<10KW) is a big success (30% investment subsidy). It is widely expected that the subsidy will be withdrawn in 2020 as then solar batteries will be so cheap in Germany that smaller PV-solar owners will buy them anyway. Apparently this site only lets you reply so many posts in, so this is in response to both Nathan and gbsr…. Already some solutions are approaching $0.02 / Kwh stored and released. That is too high for general use, since that is roughly what it costs to generate electricity in the first place, but already looking attractive as a replacement for peaker plants. Obviously prices don’t drop exponentially for any product, but they don’t have to – a couple more cycles and storage will be a sensible addition to any segment of the power grid. Although commercial generation has dropped in price, it is not and never has been an exponential decline and already physical limits are being reached. Contrasting any linear progression with an exponential progression such as solar panels, sooner rather than later it will simply be too expensive for any physical generating plant to compete with alternative sources such as solar and batteries. Other solutions may emerge also as cheap, but they won’t burn hydrocarbons or radioactive fuel. It is already inevitable, and there is nothing governments nor utilities can do to either speed up or slow down the innovation cycle enough to make a material difference in the outcome. Bill, batteries will never “replace” peaker plants, or any other dispatchable generation. Apparently you assume there will be unlimited generation with which to charge them – an assurance impossible to make with “renewable” energy (in itself a thermodynamic impossibility, but beside the point here). The alternative is after some period of cloudy, windless weather society will accept the lights going out – and I confidently submit that scenario is a non-starter. Even the most efficient storage wastes at least 5% of the energy going into it from resistance losses, and you conveniently ignore the efficiencies of scale inherent in centrally-generated electricity transmitted at high voltage. So it really doesn’t matter what progression in downward price you choose – linear, exponential, logarithmic, take your pick: solar and batteries could cost nothing, and they will never compete with dispatchable thermal and nuclear plants (assuming that’s what you mean by “physical generating plant”). Never have, never will. That you consider that possibility as “inevitable” is amusing, to say the least – similar projections have been made since the 1800s; every one of them has yet to come true. Bob, on what do you base this apparently unsupported assertion? Just your opinion? The most likely outcome is that as renewable generation continues to decline in price that people WILL in fact “overbuild generation capacity” – because cheap batteries will allow us to store the excess when the sun shines and use it when we need it. Batteries all full? Solar panels or windmills are simply disconnected en-mass and that excess capacity is “lost” until such time as demand catches up with supply. This is ridiculous. We “only” need enough generation on average to cover some percentage more than average demand under the worst conditions, and enough grid storage to cover a week or two, to eliminate traditional peaker plants entirely. Even nuke plants can be spooled up and down given a few days’ notice; even cloudy days produce SOME solar power. I’m not quite sure what planet you are from. If solar and batteries cost absolutely nothing, we’d be neck deep in them and there would be no other form of generation. Everything has a price, and we are talking about an optimum economic solution. By “physical generating plant” I am of course referring to any form of traditional power station. But, solar and batteries don’t have to be free to replace traditional power completely – only sufficiently inexpensive that some combination of solar and battery reserve can utterly replace traditional plants and assure we can cover the worst imaginable conditions for less than the cost of traditional plants. To claim that this is NOT inevitable makes you sound like those folk who, in 1890, proclaimed men would die if they ever exceeded 60 miles per hour in speed. The solar example is exactly that – an example. Nothing says we won’t all be using Mr. Fusion in a few years – yet if that is the “cheapest” solution it is still clean alternative energy, and will still replace traditional generation. It’s already over, the products simply won’t be on our shelves for a few more years yet. Oh, and if you happen to be an AGW alarmist? That’s over too (presuming the science is correct and it ever was a possibility). Using some simple napkin estimates, and the projections from the world’s most economically conservative financial groups, we can conclude that by around 2070 we will effectively be CO2 neutral leaning towards declining – and using the charts from the IPCC Report we can predict no more than another 1/2C temperature rise before it starts returning to “normal” (assuming the current Ice Age doesn’t end raising temps or that the Interglacial period we are enjoying doesn’t end lowering temps – both of which are about equally due). But…but…I thought we weren’t “burning hydrocarbons or radioactive fuel” anymore? The sun must have gone down…who could have seen that coming? Maybe we should recycle all those solar panels, batteries, and wind turbines. Maybe it would be best to just build more carbon-free nuclear reactors – not the 1960s-era ones which need a “few days notice” to spool up and down, but those fancy new ones built after 1980, which can spool up and down all day long. The cadmium from useless solar panels makes a great neutron absorber for control rods; lithium from useless “grid-scale” batteries can be recycled for new EV batteries. Oops – sounds like you happen to be an anti-science climate denier. Conversation’s over – have a nice day! But neither your goal nor your problem are mine. Your goal is powering the world with renewable energy at any environment cost. My goal is finding practical solutions to climate change. So you’ll have to pardon me for admitting I can sleep well at night should North Anna 3 and my goal prove to be a stumbling block to yours. Your information is not precisely “wrong,” merely incomplete. Storage costs are not dictated solely by the number of Kwh a battery may hold (which would appear to make Lead Acid still attractive when compared to other technologies), but also by the total number of charge / discharge cycles the battery can endure before requiring replacement. Do not take my word for it, there are literally thousands of articles you can easily find by using your favorite search engine. The lifetime cost per Kwh which can be stored / discharged has been dropping by half about every 5-8 years for about 50 years. Companies like Aquion, Ambri, 24M and others are just bringing to market solutions which may cut the cost in half again or even better, while still more developments are in the labs. Ambri is in particular an interesting possibility as their batteries may literally last forever – so even a higher initial cost may be economical over the long term. I have yet to see a single article suggest that this progress will slow or halt over the next 20-30 years, but if you have information to this effect I would certainly like to know about it. Vehicles are a special case, because weight and volume are almost as important as price. However, they also present a special kind of value because the “fuel” to power an electric car only costs about 20% of gasoline at the pump – so over the lifetime of the vehicle some amount of cost difference becomes the best economic choice. The under-construction “gigafactory” may in fact get existing LiIon batteries over that price hump for personal vehicles; if not 24M’s approach certainly will. Let the French reprocess our spent nuclear fuel (SNF) since they already use reprocessed spent fuel in producing power. We in the US don’t reprocess SNF since it is cheaper to mine uranium however if we had selected the right nuclear power technology a Molten Salt Reactor (MSR) demonstrated at Oak Ridge National Labs in 1950-1960 time frame then it would be cheaper to recycle SNF for fuel than mining new fuel. Additionally nuclear waste would be minimal and manageable, Nuclear Power would be safer, cleaner and cost effective estimated at 2.5 cents per Kilowatt hour. Kirk Sorensen of Flibe (which is farthest with MSR development in US/Canada) questioned repeatedly at the Delft MSR conference stated the expectation that the electricity costs of MSR would be similar as present new reactors. That is 10 – 20 c/KWh (for Hinkley and Vogtle). I’m not sure this is accurate. Your graph there, for example, illustrates nicely why nuclear is necessary: demand never falls below ~ 21 GW. It would make sense, then, to have an installed baseload of nuclear, and have a load-following system of majority renewables with some natural gas to do the final curve matching. Indeed, this is what is presently in place, with coal largely standing in for the role nuclear is ideal for. If your goal is to have maximum possible deployment of wind and solar, sure, nuclear is a problem. If your goal is to reduce carbon emissions from our electricity systems with minimal capital investment, though, “maximum possible deployment using wind and solar” is not the correct subordinate goal, and a mix of nuclear, renewable, and gas is the ideal. If you want to reduce carbon with minimal investment than you should exclude investment in nuclear. Because it takes 10yrs before nuclear starts to produce. Even now the investment for wind & solar capacity is already lower, but in 2025 it will be much lower. Hence you get far greater carbon reduction for your dollars, if you put it all in renewable as Germany, Denmark, etc. Even France is now reducing the share of nuclear from 75% now towards 50% in 2025 (new law), and will probably move towards 80% renewable in 2050 as that scenario is calculated to be the cheapest by the responsible French government institute. Ivy, you claim nuclear makes clean energy harder, but your plot of PJM hourly electricity demand can be very closely approximated by a 70/30 capacity combination of nuclear and solar power! We can make the approximation better by adding 5 hour of energy storage (to extend solar into the evening, or better yet, shift a few hours of night time nuclear to daytime). In fact, most of the grid-scale energy storage in the world today was built during the first nuclear era (before environmental groups intervened to help the fossil fuel industry withstand the nuclear competition). Going forward, we can also expect that widespread use of electric vehicles will boost night-time electricity demand, thus boosting baseload demand, and increasing the appeal of nuclear. A bigger problem with the nuclear+solar combination is solar’s very poor Winter-time performance, and erratic Spring and Fall output. In most non-desert locations, a higher nuclear fraction is better due to nuclear’s excellent seasonal demand matching (due to the fact that nuclear refueling outages are always planned for times of low demand). See this TEC article: http://www.theenergycollective.com/todayinenergy/2250344/us-nuclear-outages-are-low-during-summer-peak-electricity-demand-season and graph http://www.eia.gov/todayinenergy/images/2015.07.17/main.png. We know from real-world experience in France, Sweden, and Switzerland that a grid built around nuclear and hydro (with nuclear load-following and a modest amount of pumped-hydro in the relatively hydro-poor French case) has almost no need for fossil fuel, and provides very affordable electricity. With today’s technology, wind and solar become more and more difficult as the fossil fuel contribution drops below around 70%. As Germany increases its use of solar and wind, its pumped-hydro energy storage plants are proving uneconomical, and it has deployed a new generation of fast-throttling coal fired plants to use along-side its renewables (see this Siemens press release http://www.siemens.com/press/en/pressrelease/?press=/en/pressrelease/2013/energy/power-generation/ep201312013.htm&content%5b%5d=EP&content%5b%5d=PG and this pumped-hydro article http://www.icis.com/resources/news/2014/09/03/9817356/german-pumped-storage-in-crisis-as-solar-crushes-economics/). We can imagine a grid powered with wind and solar, but we don’t know how to build one affordably. Today, they guarantee a dominant role for fossil fuel. – France is reducing nuclear and calculated that migration towards 80% renewable in 2050 is the cheapest scenario. – Sweden and Switzerland decided to not build any new nuclear plant and to end nuclear when the existing plants are at the end of their license period. Sweden is installing major new wind capacity, Switzerland more solar. The reason is simple; The cost price of electricity from new nuclear is 2-5times higher than renewable solution. You make progress by recognizing it’s possible! Regarding the costs, I recommend you to study e.g. the French government report which concluded that migration towards 80% renewable is the cheapest solution, or the German Agora scenario studies. t had days in which wind produced 100% of all. They expect to produce 50% of their electricity by wind in 2020 and then have 100 days a year in which wind will produce >100% (they export and develop P2G), Target 100% renewable in 2040. Similar is coming in Germany. Wind+solar produce ~20% now (total renewable share is now ~30%, increase with ~1.5%/a). So there is is no place for base load plants in the future grid! German utilities concluded similar as they are replacing base load plants (often coal) with flexible generators (some lignite which use the low temperature burning circulating fluidized bed process as that allows for flexible operation and increases efficiency from 33% towards 44% delivering a cost prices of ~2.5 c/KWh). Last year the biggest German utilities E.on and RWE decided to move away from central power plants as they estimate those can no longer compete in the future. *) These countries are anyway 1-3 decades ahead of USA. Also with their electricity market design, separating the grid completely off from electricity generation & selling (also in NL). Though I was skeptic, I’m now convinced that that has been one of the best things free competition directions in the EU brought. It decreased prices and increased choices. I can now chose from ~20utilities. Some deliver 100% wind (often with a cooperation model in which you participate) others 100% renewable, cheapest price, 100% nuclear, etc. Last year Denmark generated ~35% by wind (little solar as it is at the latitude of Alaska). It had days in which wind produced 100% of all. They expect to produce 50% of their electricity by wind in 2020 and then have 100 days a year in which wind will produce >100%. They target 100% renewable in 2040. As German utilities concluded also. They are replacing base load plants (often coal) with flexible generators (some lignite which use the low temperature burning circulating fluidized bed process as that allows for flexible operation and increases efficiency from 33% towards 44% delivering a cost prices of ~2.5 c/KWh). *) These countries are anyway 1-3 decades ahead of USA regarding electricity generation. Also with their electricity market design, separating the grid completely off from electricity generation & selling (also in NL). Though I was skeptic, I’m now convinced that that has been one of the best things free competition directions in the EU brought. It decreased prices and increased choices. I can now chose from ~20utilities. Some deliver 100% wind (often a cooperation in which you participate), others 100% renewable, cheapest price, 100% nuclear, etc. Personally I believe that solar plus batteries will ultimately be the cheapest form of energy for the majority of humans, while nuclear or other solutions will make more sense in regions with insufficient sunlight. BTW, I responded to another one of your posts but clicked the wrong “Reply” link, so it was further below the original post under another poster. You are right that NPP’s can and are completely taken off-line. But as I explain above that doesnot imply that they (can) do load following at reasonable extra risks/costs.. . Regarding MSR, read the full story of the MSRE. Your idea about switching on/off is far too romantic and doesn’t fit with the figures. Realize also that it’s capacity was ~1% of the capacity a small reactor needs (7.4MWth = ~2.5MWe), that it used a radiator for cooling, etc. Realize than the unsolved issues. TAP start-up may have solved the issue with the graphite moderator but some difficult to solve issues, which prevent a 30years operational period, stay. It all doesn’t sound cheap, so the reactor may only be used in special places (if at all). The paradigm changes completely with cheap grid storage, and cheap grid storage is already for all practical purposes a done deal – it is like an avalanche coming down the mountain and at this time it is simply too late to stop it even if we wanted to. That is, unless you know of some impending catastrophe which will mysteriously bring all progress to a halt. If you do, please tell us so I can change my investments! 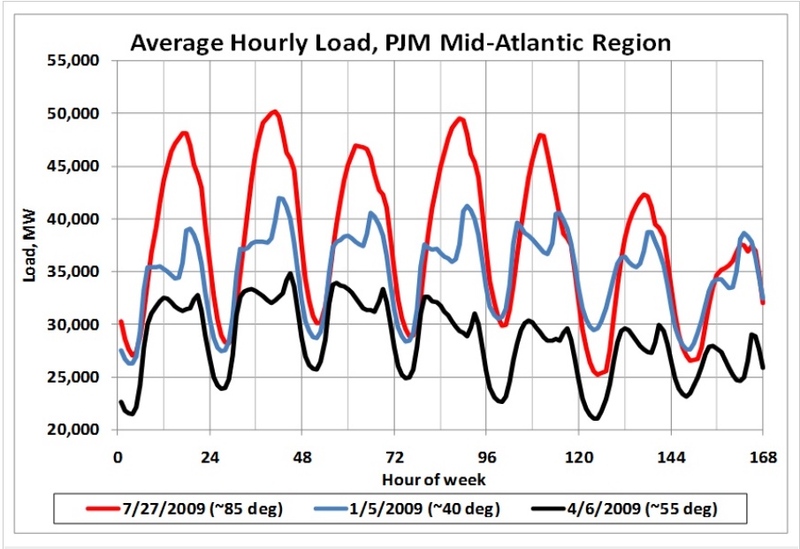 Given cheap grid storage, power producers can plan ahead by weeks instead of minutes. The ability to shut down / restart some production will then be sufficient to keep the grid stable, even if it takes a couple of days to cycle a plant. Yes some fuel is wasted, but Uranium is still relatively cheap. Producers might “take turns” at being the plant shut down, and use those shutdowns for planned maintenance. Given that it takes 10 years to get new nuclear plants on line, it makes sense to start planning on the inclusion of grid storage as part of the financial projections. My preference for LFTR or other Thorium fueled reactors is, for the time being, esoteric rather than dogmatic. If TerraPower or one of the many other contestants provides a cheaper solution in a shorter time (and I include waste sequestration in that formula), then I am in favor of it. However… Apart from the sheer difference in efficiency and ability to consume wastes using a LFTR plant, estimates of obtainable Uranium fuel resources, if we switch a large percentage of global generation to that fuel, are only on the order of a few hundred years due to both scarcity and inefficiency of fuel consumption. That is not a short time, but it seems like jumping back into the same trap we put ourselves into with coal and oil. It also increases the storage issues for all of the waste products, kicking the can down the road. We get enough of that behavior from Washington already; it is sub-optimal at best and criminal at worst. Of course, maybe 200 years will finally be enough to create cheap, clean fusion power…. Cheap battery storage is one factor. The continued price decrease for wind and especially solar, are another, more important factor. Those are predicted to go down in price towards 2-4c/KWh (solar) and 3-6c/KWh for wind in 2050 for Germany, which has little solar and not much wind. In solar rich Texas the solar price is already at ~4c/KWh (Austin utility buys for that price). There is no way that any nuclear fission reactor design can compete with those prices. Even now it’s extremely difficult for nuclear. Only protected monopoly utilities & countries with strategic considerations (e.g. Arab states against Iran/Israel) buy nuclear nowadays. As the price difference with cheaper renewable increases and becomes more visible, the nuclear plant build business will die gradually. Only fusion may make a chance if they find a method to avoid the expensive steam generator – steam turbine – dynamo combination (e.g. with PV-like solar panels in the reactor chamber with materials that can withstand >900degrC. Where collision of the gamma radiation particles deliver electricity. So materials with band gaps >3volt are needed, etc). Yes, except I believe those estimates (at least for solar) are extremely conservative. The 50 year trend is exponential, with installed solar prices dropping by half every 4-8 years (depending on which figures you use – even faster for the cells alone but cells do not a system make!). To be a true system, solar must include batteries which have been dropping by half about every 5-8 years, so I believe batteries are the critical path. There is nothing I’ve seen in following the new technology announcements to suggest that this trend will slow anytime soon. However, I do believe there will still be places for nuclear. Alaska, Siberia, other high-latitude places go for months with almost no sunlight, and that’s when they need power most for heating. Affordable nuclear will open up vast areas not currently practical for population. Thanks. You are a real optimist.